For the first time in forever I am posting on a Saturday but I just had to. One- my new blog design launched today and I just couldn’t resist a reason for everyone to hop over to se it! What do you think? Julie from Deluxe Designs did such a beautiful job and I am so grateful for her hard work and patience. We’re still working out a few minor kinks but for the most part here it is. There is really one one major change for you to take note of. Look up in your browser- my new url is thebakerchick.com! No hyphens please! Everything from my old url will redirect so don’t worry about that, but if you ever want to just type it into the browser it’s so much easier now! The second reason for today’s post is 3/14 = 3.14 = Pi(e) Day! I love this silly foodie holiday which basically is just an excuse for me to try out recipes for my future Pie Shop. I always struggle a teeny bit to know what type of pie to make in March. Spring/Summer is all about fruit, Fall is all about pumpkin & pecan, but what does that leave us for winter? Citrus of course, and all the custardy pudding pies you could dream of. I’ve made lemon meringue pies before, but never this custard variety that I actually like so much better. The filling is smooth and tart, kind of custardy without any of the effort of making a custard. The fluffy whipped cream makes each bite so well balanced: slightly salty crust, tart creaming filling, sweet cream topping. I absolutely adore this pie. 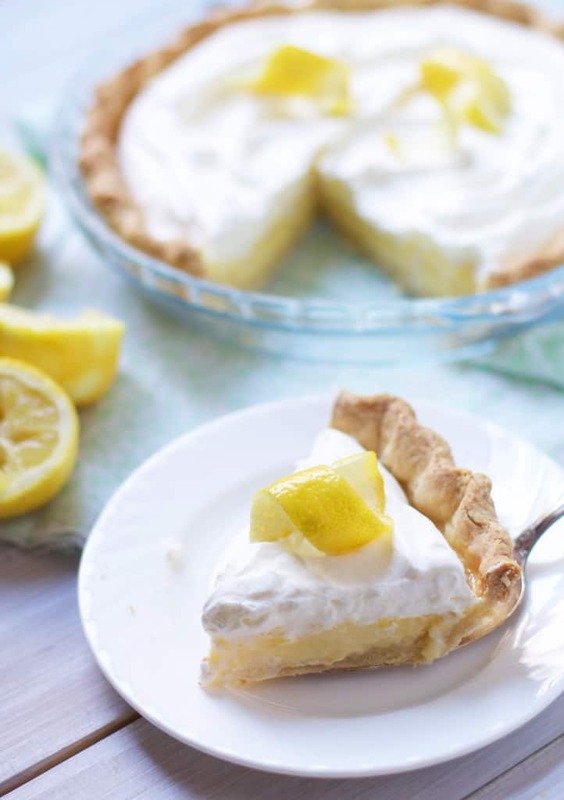 It’s such a crowd pleaser for the lemon loving crowd and in my opinion so much easier than some of the other lemon pie varieties. This one is a keeper folks! Have a great weekend! Preheat oven to 425F. Roll out your crust and drape it over a 9-inch pie dish, trimming and crimping the sides. Prick the bottom of the crust with a fork and pop it in the freezer while the oven preheats. Line the chilled crust with foil and pop some pie weights/dried beans/rice into the foil and bake the crust for about 20 minutes, or until the edges are set. Remove the the foil and bake for another 5-10 minutes. If the crust puffs up just flatten it with a fork. Reduce heat to 350F. Whisk together the eggs, lemon juice, sour cream, salt, sugar and zest. Pour into the crust and carefully place back into the oven. If using the gelatin, dissolve it in some cold water and then place in a saucepan over low heat, stirring until dissolved. Let cool slightly. Whip the cream and sugar with a whisk attachment until soft peaks form. Add the liquid gelatin and continue to whisk until medium peaks are reached. 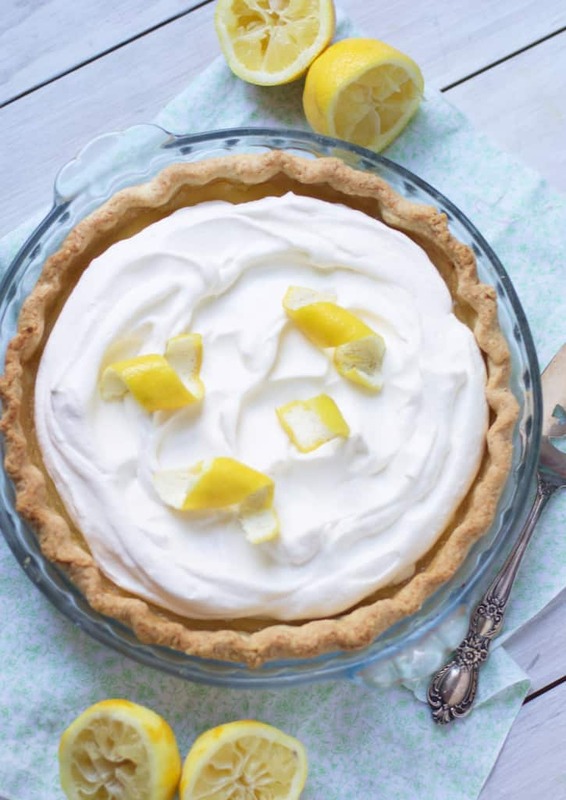 Spread whipped cream onto cooled pie and serve cold. * the gelatin in the topping stabilizes it, which prevents the whipped cream from getting all droopy after a few hours. If you plan to serve this pie right away, you don't need to do that step, but I really recommend it if you are making it in advance. Your redesign is so cute! I love the pastel colors and the new headshots! The ‘pin it’ button is adorable! I love it! And this pie. I’m working all of the time right now and then as soon as I get done with this 20 day work marathon, I’m less than a month from getting married. So, see, I need you to make me this pie and bring it to me. And don’t forget Hugo. I could really use a baby snuggle, too. Your site is gorgeous (and don’t you love not having the whack-a-doodle URL?). First, LOVE the new design! The colors and font are gorgeous. Second, LOVE this pie. I want to eat the whole thing for breakfast! Oh my god I am OBSESSSSED with this new design! It’s PERFECT!! Your new headshot is STUNNING, of course! I wouldn’t expect any less from your gorgeous self! Congrats! The new site is goooorrrgeeeeooouuusss. Much like you. :P I have been so in a pie mood ever since pie day. All I want to do is bake pies! I’d better stock up on some lemons this weekend and get this in my life. Great recipe! What about changing the sour cream with “normal” cream? Here in Italy sour cream is actually impossible to find..